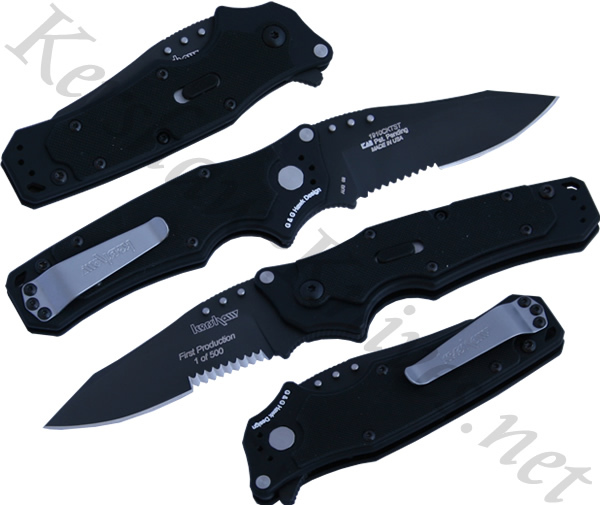 This model 1910CKTST is the Kershaw RAM black partially serrated knife. The Sandvik 14C28N stainless steel blade is coasted in black Tungsten DLC thus giving it a non-reflective look. The blade is deploy by a flipper on the back of the knife which makes it as fast or faster than assisted opening blades. The handle is made of 6061-T6 anodized aluminum with textured G10 overlays. Inside the handle is a piston lock that holds and releases the blade.